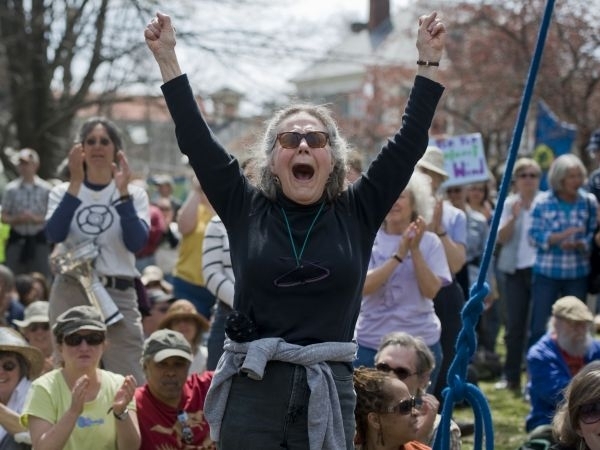 More than 1,000 people turned out Saturday on the Brattleboro town green for a rally to show support for decommissioning the Vermont Yankee nuclear plant, one of the oldest nuclear power plants in the country. The event included speeches by U.S. Sen. Bernie Sanders and Gov. Peter Shumlin, both of whom are calling for the state’s wishes to be honored and for the 40-year-old Vernon reactor to be shut down. New Orleans-based Entergy Corp. owns the plant, whose state permit expired in March. The Vermont Senate voted to decommission the plant. But the federal Nuclear Regulatory Commission issued the plant a 20-year license extension anyway, leaving the plant in legal limbo. In January, a federal judge issued an order that allows the plant to continue operating while the case plays out in court. Unlike a March 22 protest in which 130 people were cited with trespassing after walking three miles from downtown Brattleboro to the plant’s corporate headquarters, there were no arrests and no disturbances at Saturday’s rally. Putney resident Nancy Olsen, 65, a teacher, said she stumbled upon the rally and stopped to see what people had to say. Overall, she said, she has mixed feelings about the plant remaining open. "When the school distributed iodine pills to the teachers it was a little bit of a shock, because I hadn’t really thought about it that much," she said, referring to the pills that were handed out at Brattleboro Union High School during last year’s tritium leak to counteract the radiation poisoning. "But I know I have the parents of students I teach work there, and so it’s a really difficult topic. At the same time, Entergy has not done a good job of seeming to maintain the plant. And that’s a real concern." During his speech to the energized crowd, Sanders criticized the NRC for what he said is an overstepping of its legal bounds. He explained that under federal law, the NRC is responsible for making sure power plants are safe and nothing more. "That’s their job," Sanders told The Associated Press. "They are not supposed to be an advocate for expansion of nuclear power. They are not supposed to be an ally for the nuclear power industry. Their job is really quite limited: It’s to make sure that the plants are as safe as possible." He also pointed out that the NRC’s decision to keep Vermont Yankee open, despite the wishes of state officials, flies in the face of Vermont’s rights. He reminded the crowd that in 1983, the U.S. Supreme Court said states can slow down or end nuclear power within their borders for non-safety reasons. Shumlin echoed that point in his speech, citing economic and trust issues as reasons the state should fight to close Vermont Yankee. For example, he said, several power providers in the state declined to partner with Vermont Yankee, finding there were other, more affordable options. He also accused Entergy of being bad business partners, saying there were 10 instances where the company had been at best misleading and at worst dishonest with the public and state officials. "(Let’s) say to the aging nuclear power industry," Shumlin said, "shut them down, go home, tell the truth, we’re moving on, we’re moving out , you go first, we’re not going to rest until you’re gone."